Proper maintenance & safety programs are very important. Certain hazards associated with grinding machinery depend on many application specific details. Machine owners must develop & utilize specific safety and maintenance programs to support their specific use of the machine at their job site. Most job sites and applications are different, and some potential job sites and applications may not be appropriate for the use of certain types of grinding machinery. With this, owner’s and operators must read and understand their machine’s serial number specific owner’s manual and all safety information as part of understanding their job site limitations prior to starting to use the machinery, because special control measures are always required at some level if grinding machinery is to be used. Possible projectiles, & fire hazards are among the hazards to review and control prior to starting operation. Many areas require special permits associated with certain processing at certain sites so understanding local regulations is also important. 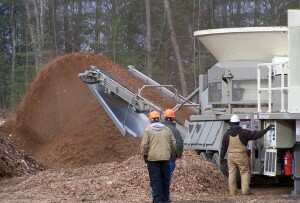 HogZilla grinders are primarily used to process most organic materials. This specifically includes wood grinding and compost processing as common applications for most grinders. HogZilla grinders are not intended to process rock, concrete, or metal. There are grinding methods to aid in processing that may contain nails and low levels of contamination, but planning, preparation, and great care are needed to make sure that the process is safe and productive. Controlling the input material is of great importance to avoid accidental inclusion of something that was not intended and possibly causing catastrophic hazards. All waste processing requires a process review to assess the machine’s capability and set up requirements to be sure that the machine can safely process the material. The likelihood of contamination must be defined and controlled. Health hazards associated with being exposed to the material have to be considered along with the machine’s capability to safely, effectively, and productively process the material. Some special waste processing applications may be found to be possible through special set up such as scrap tire processing. Scrap passenger car tires, over the road truck tires, and many other scrap tires may be able to be processed with most HogZilla tub grinders as long as the proper set up options are installed on the machine. This is just one of many application examples, and there are variations within each application including variations of desired output product characteristics that must be considered. Most applications require support equipment to operate with the grinding equipment, and some applications and job sites require special provisions to enable processing safely and productively. Most HogZilla grinders are offered with a range of optional equipment, and some options influence performance, safety factors, weight, and portability so owner’s and operators must know and understand their machine as well as the optional equipment that is available whether the machine was purchased new or used. Optional equipment for most HogZilla grinders include rigid & swing hammer variations, bolt-on & weld-on hammer variations, partial mill cover deflectors, custom thrown object restraint system variations, fire suppression system variations, and water injection systems with factory or field installs available for both new and used machines. Proper care and maintenance is also very important for all areas of the machine. damaged or poor condition machine is allowed to operate. In addition to training assistance programs, parts & service, replacement owner/operator manuals & safety decals for HogZilla grinders are available, and many machine options are available for both new and existing machines through the HogZilla sales and service department. Know & Understand Your Application & Mill Configuration. Click here for additional Safety & Educational Training. Click here to Register your Pre-Owned Grinder. your machine in optimum running condition.